Beth is the voice behind Hello Splendor and a principle designer at Nest Interior Design in Dallas, Texas. I stumbled upon her blog via twitter and now have a massive girl crush on her. While I think a next step in my plan to become BFF you can sit down and enjoy a day in Beth's life. 6:30 am - Wake up to the sounds of little grunts and groans as Maxton begins to wake up... He's 9 months old today! Happy birthday buddy! Kiss my husband, roll out of bed, get coffee started, and gather myself before I get Max up for the day. 7:00 am - Walk into Max's room to a big smile! Kiss him. Change him. Feed him. Then play with him for a bit as he crawls and tries to walk. It's such a nice time in the morning with Max... I have to struggle to not think about all the things I need to do for the day and just enjoy him. 8:00 am - Put max in the exer-saucer (aka neglect-a-saucer), so I can get to blogging! I compose my blog post for the day and post it... tweet it... and facebook it. 8:30 am - Hop in the shower and scramble to get ready. I got caught up chatting with my pals on twitter, now I have 30 min to get ready for my day! 9:00 am - Head to Max's 9 month checkup! He passed with flying colors... I can't believe he'll be one year old in just three months. 10:30 am - Kiss my husband and Max goodbye in the doctor's office parking lot. As Daddy takes Max to day care, I head to the design studio to get some client budgets out, make some last minute design selections for a client, and meet with my fabulous design assistant to give him his To Do list. 12:00 pm - Lunchtime! This is my favorite part of the day, typically. It's my social hour! Today, my partner in crime is my new friend Bryn from Bryn Alexandra Interiors. We had lunch at a new spot in Dallas and stopped by the Nest Boutique. Bryn & I met through the blogging world and got to meet in person for the first time today while she was in town. She is as sweet as can be and super talented! We have a ton in common! Looking forward to getting to know her better... Isn't the blogging world great? 1:30 pm - I get to work on securing donations for my favorite non-profit, Dwell With Dignity. I also get news that I secured a celebrity designer/tv personality to judge the Dwell With Dignity contest designed to raise awareness... I'm on cloud nine, but have to head to a client's house! 2:00 pm - My client was having their drapery installed today, so I stopped by to supervise and present the next phase of their project. The drapery looked amazing and I'm really looking forward to the next phase of this funky project! 4:00 pm - After a long meeting/install, I make my way back to the office for the exciting task of pulling together estimates. I manage to get out two more estimates this afternoon... I'm ready to be done with paperwork and get back to designing! But, before the day is out I have a final client meeting to present their budget and final design selection. 5:30 pm - I skype my dear friend Lauren! She just moved to England and has been travelling Europe. We were finally on skype at the same time so I just had to take the time to chat before leaving the office. Miss her! 6:00 pm - This is where I get to see my family! I head home to meet my husband and Max for dinner and we end up going out to eat. I love the evenings when I get to catch up with my husband... hear about his day and tell him about mine. During tonights dinner, Max had his first french fry and some ice cream! We won't make a habit of this. But, hey, it's his birthday! 7:30 pm - We get home from dinner and play with Max some more... tickles... laughs... bouncing... walking... songs... it's just the best! Now it's time for bed. Diaper change, a kiss on the head, and it's bedtime. 8:00 pm - Back to work! Hitting the sofa to work on my consulting job. Aside from being an interior designer and blogger, I've also been reeled into helping a friend with marketing for her cosmetic company, Susan Posnick Cosmetics. It's a company and product I believe in, so I'm happy to help! 9:00 pm - Guest blog time! I put everything else aside to compose this post and contemplate my day... It's been a busy one! 10:00 pm - I am done for the night! I plan on washing my face, crawling in bed next to my husband, contemplating how I can take a few things off my plate, and catch up on my dvr until I fall asleep... Goodnight! Thanks Beth! It was a lot of fun to read about your day! How cute is Max! I can't handle that sweet little face. Oh, so sweet. LOve this post. And, thank you, Bryn! Loved meeting you! I love reading about fellow Dallas gals...thanks for the post! I'm lucky enough to meet Bryn while she's in town too...I can't wait for Sunday to wallow in her talent and ideas! I love this post! I am also a huge fan of Beth and am glad I was introduced to your blog too. Great post! Three of my favorites...Camila, Beth and Bryn! And I'm in love with the black and cream pillows, especially the one with the skull motif! Thanks for sharing your day with us Beth. I love the dog and the cat together on the bed. My hubby does the same -earplugs in watching a movie on his Ipad. Is it a guy thing then? great post--i love hello splendor, always so inspiring! I loved reading about a day in the life of "Beth". This is really cool, because you get to read about how other people spend their days and lives. Cheers for that! And Beth is just too sweet! 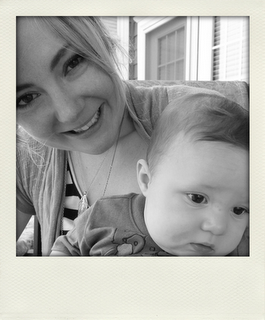 I loved reading about your day Beth and your little guy is so adorable, Happy 9 months Buddy! NYDC What's New, What's Next!